to futurity gave all that was best in you. what you believed, treachery denied. the heroic number our hopes and our fears. Jeffrey Mildwater: born 1915. Enlistment Address; 5 Hertford Road, East Finchley, London. N12. Single. Occupation: Bricklayer. CPGB. (1935) Sailed for Dunkirk: 1/5/1937 ( Vol 29. 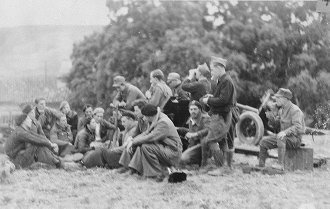 742a) Arrived in Spain:15/5/1937. Enlisted in Battalion; 18/5/1937. Attained the rank of Lieutenant. 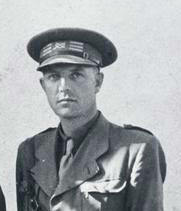 Second in command of the British Anti-Tank Battery under Hugh Slater. 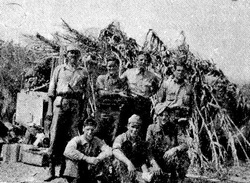 Wounded at Fuentes de Ebro on 13/10/1937 during the Aragon Offensive. Returned to the UK on 25/7/1938. James (Paddy) Sullivan: born 17/04/1913. Enlistment Addres c/o Bernard Sullivan (father) 25 Bouverie Street, Rutherglen, Lanarkshire, Scotland. Occupation; Bootmaker. Age 24. Arrived in Spain:18/05/1937. Commander No. 2 Gun. Rank: Sergeant. Known as 'Sarge'. 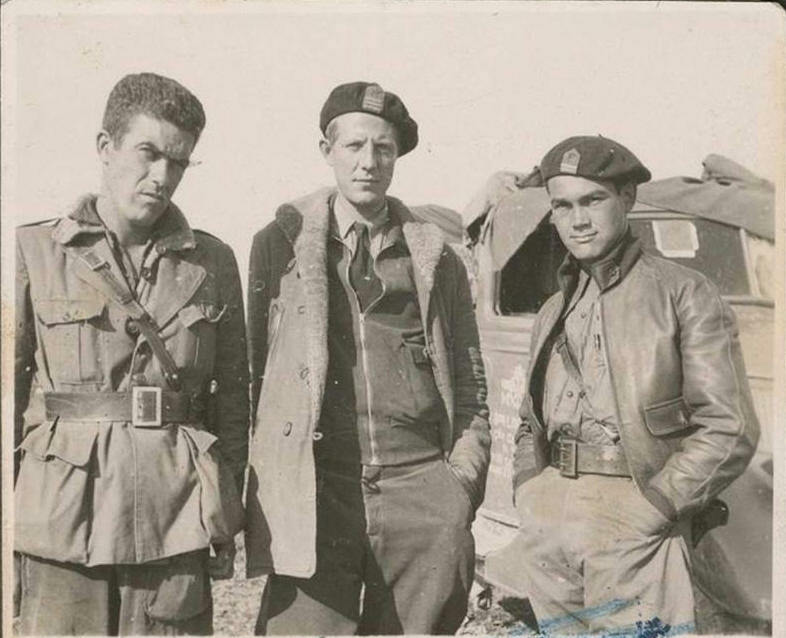 Wounded at Brunete. Joined Battalion on 12/5/1938. Rifle No: 65282. Major Attlee No. 1 Company. Squad Leader. Killed on 28/7/1938 leading his squad in an attack on Hill 481, near Gandesa. 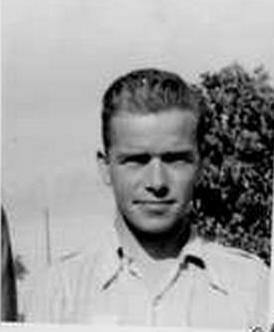 Otto Estensen: born: 9/8/1910, Thornaby on Tees. Address: Halcroft, Redcar Rd, Ormesby, Middlesborough. Occupation: ABS aboard Ship. Member of National Union of Seamen, Middlesborough Branch since 1925. Mandolin player. CPGB (1933) Age: 27. Arrived in Spain: 15/5/1937. Enlisted in Battalion; 18/5/1937. Anti-Tank Battery. Citied for bravery twice. 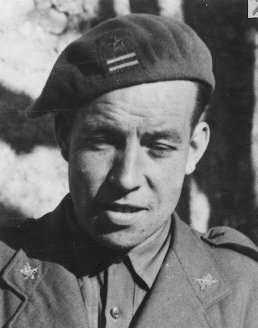 Wounded twice, once on 27/7/1938 during the Ebro Offensive. Joined British Battalion on 12/4/1938. Major Attlee No. 1 Company. Section Leader. Confirmed Sergeant on 24/2/1937. Wounded Aragon, present at Vic (Vich) hospital on 14/10/1938. 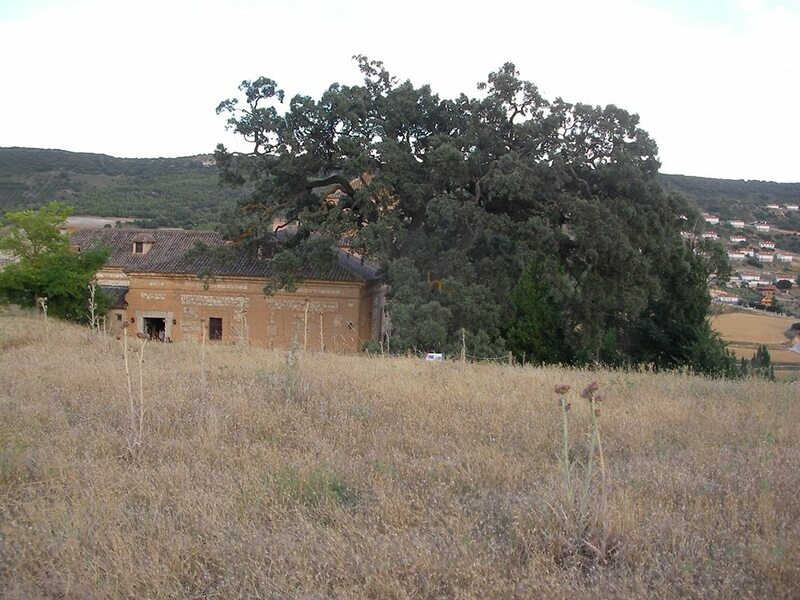 Action's participated in: Jarama, Brunete, Teruel, Seguera de los Banos, Belchite, Ebro, Gandesa. Repatriated December 1938. Died January 1979. James Francis Brewer: born: 7/4/1913, Rhymney, Monmouthshire. Enlistment Address: 15 Upper High Street, Rhymney. South Wales. Born 7/04/1913. Occupation: Miner. SWMF. Harlech College (1931-1932) Ruskin College Oxford (1934-1936) Oxford University Graduate. Single. CPGB (1937) Labour Party. Sailed for Dunkirk 25/4/1937. Arrived in Spain: 10/5/1937. Enlisted in Battalion: 13/05/1937. Rifle No: 34400. 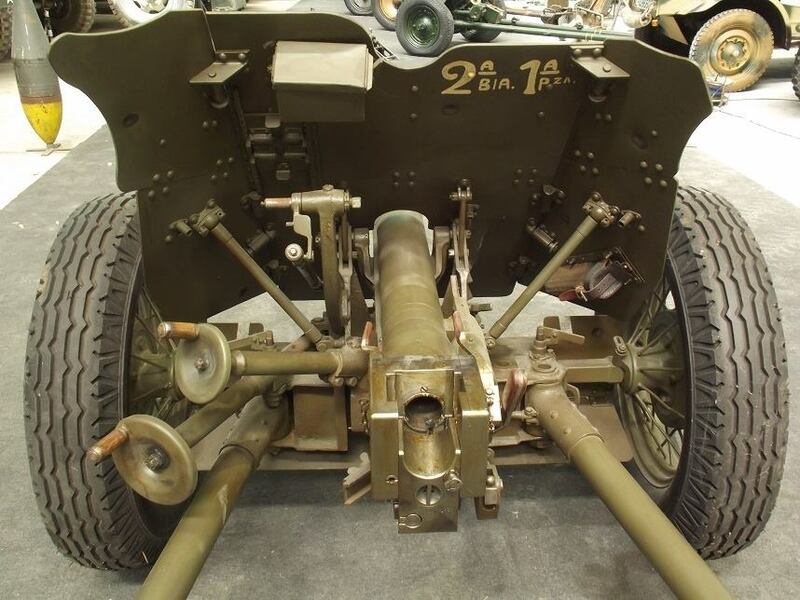 Served with the British Anti-Tank Battery. 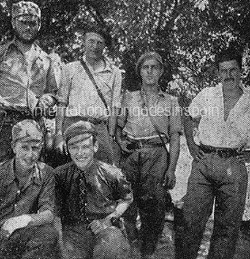 Member of Machine Gun Company (ATB disbanded April 1938) Actions Present at: Jarama, Brunete, Teruel, Seguera de los Banos, Aragon, Ebro. Repatriated to the UK 07/12/1938. Possible burial date 05/11/1993. Ronald H. Bates: Born in 1911, Nottingham, Occupation: Clerk. 38 Quarry Road, Swindon. Brother of Ralph. Age: 26. CPGB. Went to Spain via France in 1937. Joined battalion on 12/04/1938. 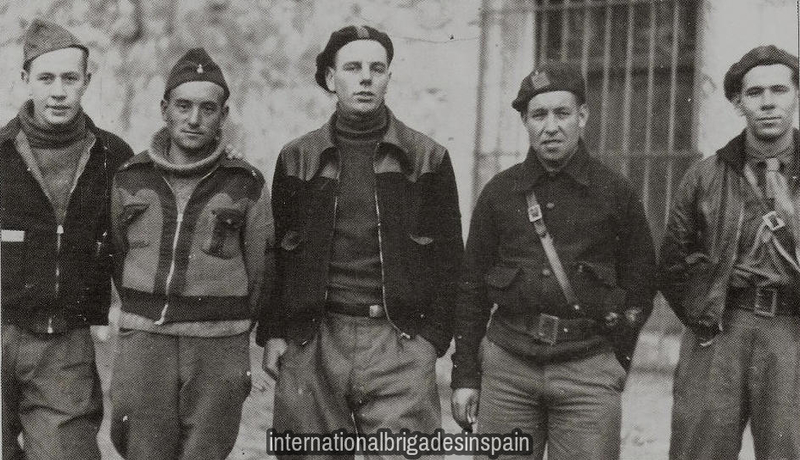 Fought at Teruel, a town situated between Zaragoza and Valencia in Eastern Spain, in the winter of 1938. Rifle No. 104544. Survived the Battle of the Ebro, but contracted typhoid and ended up in a small hospital in Barcelona before returning to the UK. Worked at Bray Court a home for the refugee Basque children. 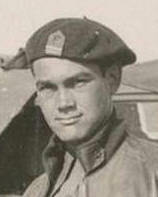 John Londragon: born: 1911. Enlistment Address; 113 West North Street, Aberdeen. Age: 25. Occupation: Railway Worker. ILP. 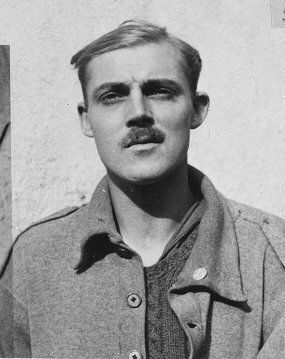 CPGB (1929) Group Leader on the journey to Spain. 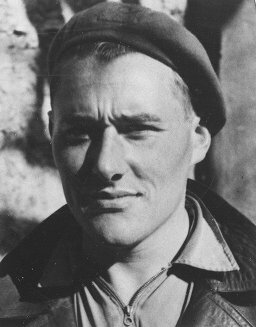 Arrived in Spain 10/5/1937. Enlisted in Battalion 13/5/1937. Member of the British Anti-Tank Battery. Wounded by shell splinter's in the leg, hand and forehead on either July 26th or 27th, 1937 at Brunete. 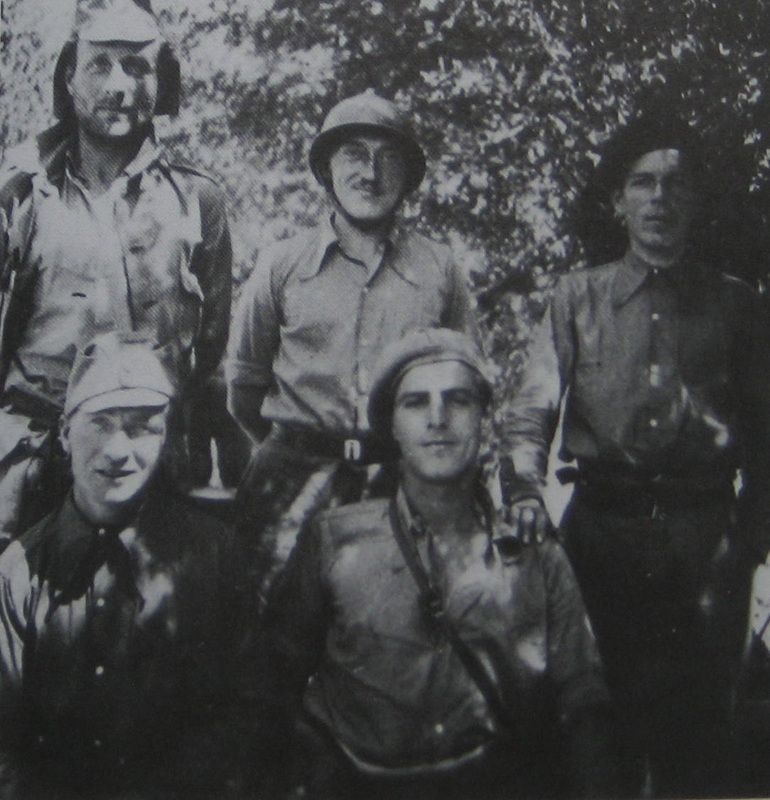 Recovered from his wounds at four hospital including Mataro and the American Hospital at Villa Paz, in Saelices. Appointed to an administrative position at Albacete overseeing the arrival of new recruits. Repatriated 2/7/1938. (PF54. 180, V51 1364.) Battalion No. 1035. Last surviving Aberdonian Brigader, died in 1993. Anthony Craft: born: 26/4/1912, Durham. Enlistment Address: 4 Peartree Terrace, Burnhope County, County Durham. Occupation: Bricklayer/Miner. MFGB. 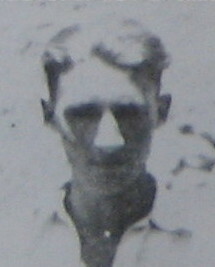 CPGB (1936) Age: 24. Left England for Spain: 1/1/1937. Arrived in Spain 5/1/ 1937. Enlisted in Battalion; 7/1/1937. 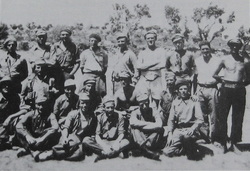 Group Leader during the Jarama action. Wounded in the left arm and head on 13/2/1937. 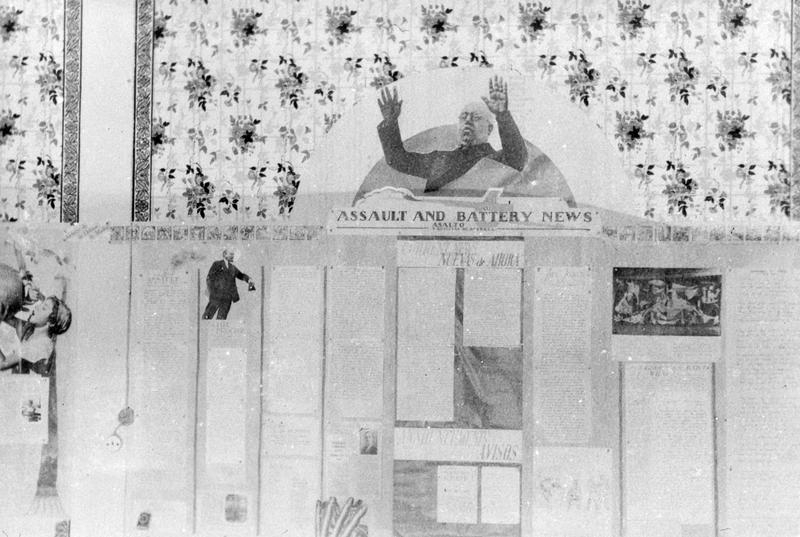 OTS, May 1937. 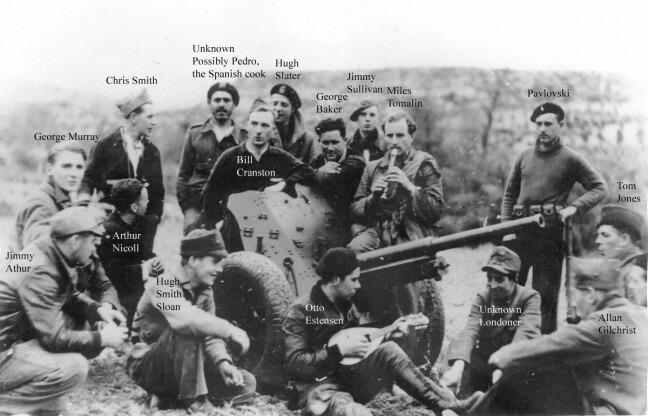 Wounded 15/11/1937. No.1 on gun. Rank: Sergeant. Served with anti-tanks at Brunete. Sanitario Service. Action's participated in; Jarama, Brunete, Caspe. Reported as being at Argaro on 21/8/1938. Repatriated in October 1938. Thomas Jones: born 13/10/1908, Lancashire. Moved to Rhosllanerchrugog, Denbigshire as a boy. Enlistment Address; 56 Chapel Street, Wrexham. CPGB (1931) Occupation: Miner. Left England for Spain 03/04/1937. Arrived in Spain 13/5/1937. Enlisted in Battalion; 16/5/1937. Member of the anti-tank battery. Reported killed in error 17/9/1938. 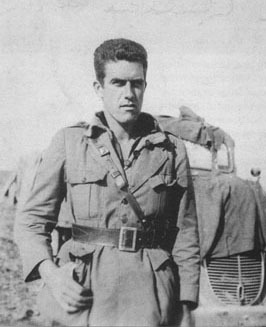 Badly injured in the right arm at the Ebro, and taken prisoner in September 1938. 11/03/1939 reported as a prisoner at San Pedro de Cardena. Released in March 1940, only after the British government agreed to sign a trade agreement that was, according to some, worth £2,000,000. Probably the last British Brigader to see Major Frank Ryan alive. Arrived in London on 2/4/1940, along with Scotsman Frank Cameron. Always know as "Tom Spain" thereafter. died 1990. George Wilson Murray: born: 31/12/1909, Newton of Tornaveen, Aberdeenshire. Enlistment Address: 6 Belgrove Place, Edinburgh, Lothian. Occupation: Printer. ILP CPGB. (1931) Sister Anne nursed in Spain and brother Tom was a Political Commissar. 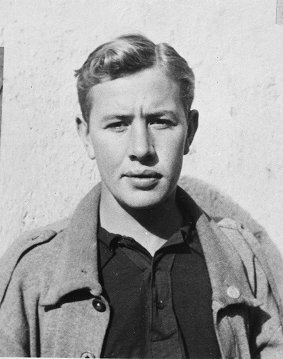 Arrived in Spain 10/5/1937. Enlisted in Battalion 13/5/1937. Member of the British Anti-tank Battery. Loader No.3 Canon. Wounded in the chest (lung) at Jarama by a sniper. Two years as an agent of SIM, (Servicio de Investigacion Militar), for the Battalion. Observer for No.2 Company. Repatriated 7/12/1938. Worked in a reserved occupation in the shipyards during WW2. William Moses real name:William Stewart: born: 3/4/1910, Airdrie, Scotland. 127 East Road, London. Plumber. Enlistment Address; 511 Young Street, Winnipeg, Canada. CPGB (1934) Age: 28. Sailed for Dunkirk: 1/5/1937 (Vol. 51, 1561b) Arrived in Spain: 15/5/1937. Enlisted in Battalion: 18/05/1937. 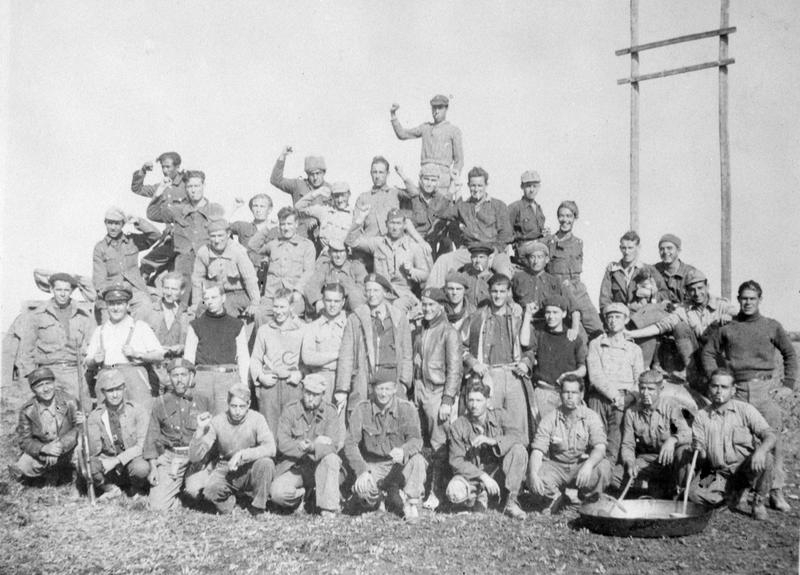 Wounded at Fuentes de Ebro 10/1937. Munitions and armoury. Repatriated in October 1938. Served in WW2, KIA 30/12/1941. George Baker: Enlistment Address; 4 Gelli Terrace, Gelli, Rhondda. Occupation: Miner. SWMF. Age: 35. Left for Dunkirk 02/05/1937. Arrived in Spain; 18/5/1937. Returned 17/09/1938. Joined the CPGB upon his return and was elected as a Communist councillor for Rhondda in 1964. Died in September 1982 aged eighty. Evan J. Lloyd: Bedlinog, Wales. Age: 22. Occupation: Miner. 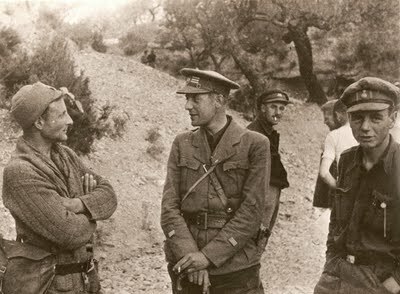 Arrived in Spain, May 1937. Cook. 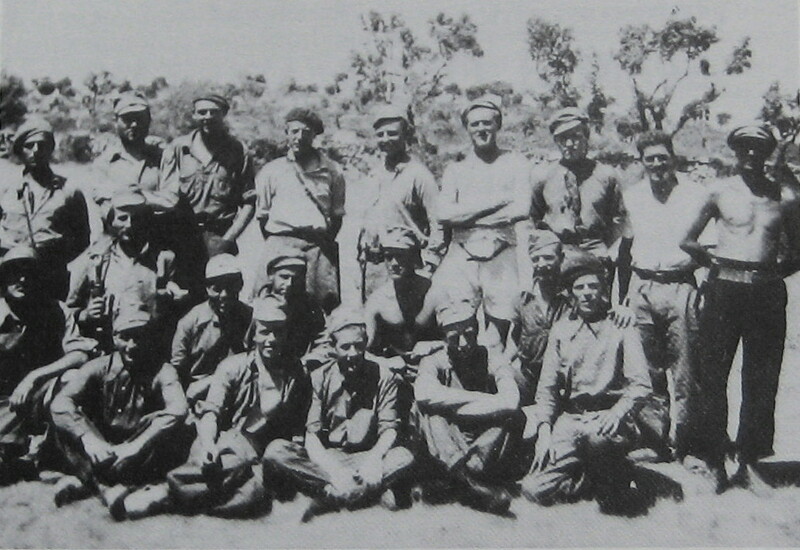 Wounded at the Ebro 26/7/1938. William 'Paddy' Stafford: born: Cork? Ireland/London SW19. Age: 35. Occupation: Leather worker. Arrived in Spain: 8/8/1937. Evacuated sick at Teruel. 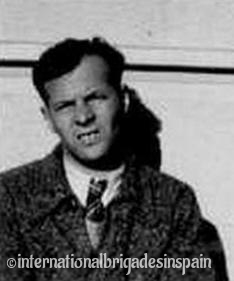 Benjamin Glaser: born: 23/5/1910. Enlistment Address: 25 Wellclose Square, London. Occupation: Cabinet Maker. CPGB (1936) Member of the Unity Theatre Club, London. Single. Enlisted in Battalion: 18/5/1937. Member of the British Anti-Tank Battery. Reported to have suffered from shellshock but insisted on rejoining the Battery. Killed in action on 8/9/1938 whilst with the Division machine-gun company in the Sierra Cabals during the Ebro Offensive. Members of the Battery: From Left, Otto Estensen, Sergeant Jimmy Sullivan, Canon No 2. unknown, Huge Sloan, Frank Proctor. 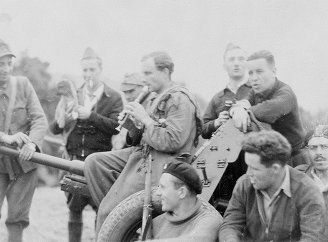 Members of the Anti-Tank Battery at Aragon August 1937. Back row 4th left Hugh Slater, (6th left) Jim Brewer, Middle row second left Miles Tomalin, Arthur Nicoll, Otto Estensen. Front row: Bill Cranston, Huge Sloan, Chris Smith, Tom Jones. Battery Gun Commanders: From left: Sergeants: Chris Smith, Mino Delfin Saturnino, Jimmy Sullivan, Battery Commander Arthur Nicholl and Sergeant Otto Estensen. 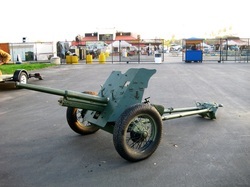 A 45mm Anti-Tank Gun similar to the one used by the British Anti Tank Battery in Spain. Each gun had a crew of nine including an observer, loader and ammunition carriers. 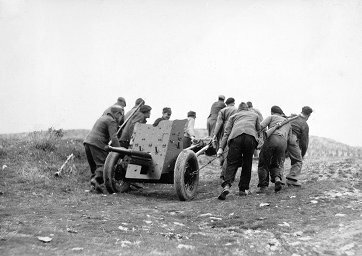 The battery disbanded during the retreat from Aragon in early 1938. 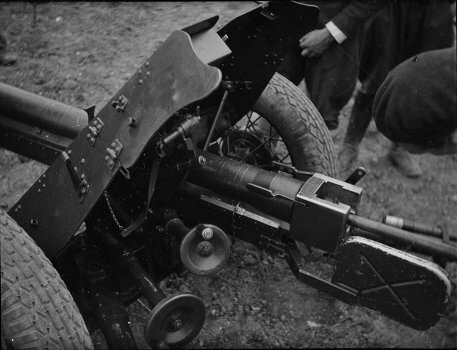 A 45mm Anti-tank Gun similar to the one used by the British Anti Tank Battery in Spain. Capable of firing both armour piercing and high explosive shells to a distance of 12km. The battery had three of these Soviet made guns. Back row left: Miles Tomalin, unknown, Tom Jones. front row: left, Bill Cranston, Anthony Craft. Battery Commander Hugh Slater with members of the ATB. 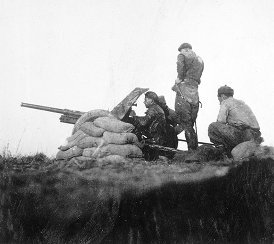 Members of the British Anti-Tank Battery. 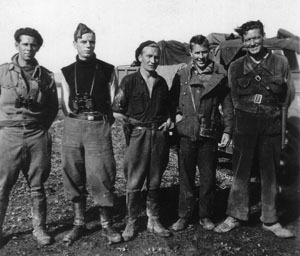 Back left: unknown, Hugh Slater, Tony Craft, unknown. front row. left: Hugh Sloan (Smith) and Frank Proctor. Ambite Palace today (same view as picture on the left, 70 or so years later) Thanks to Alan Warren for his photograph.